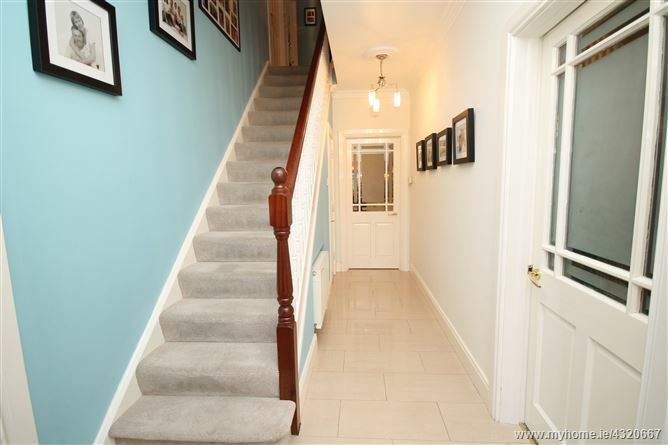 MAGNIFICENT DETACHED 5 BEDROOM RESIDENCE. 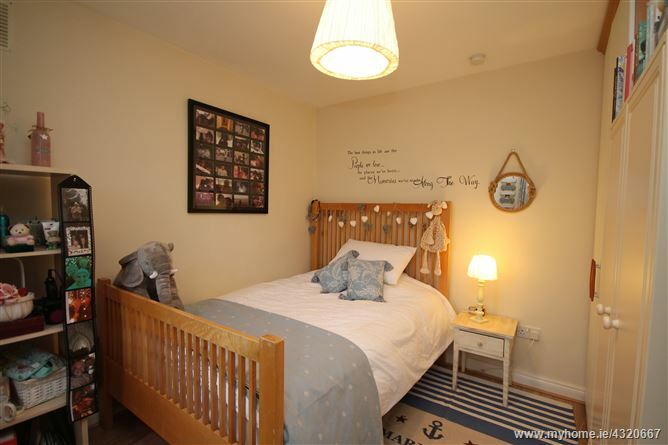 Wellesley Manor is a modern residential development of semi-detached and detached homes situated in a much sought after located at Great Connell just off the Naas Road on the Dublin side of town. 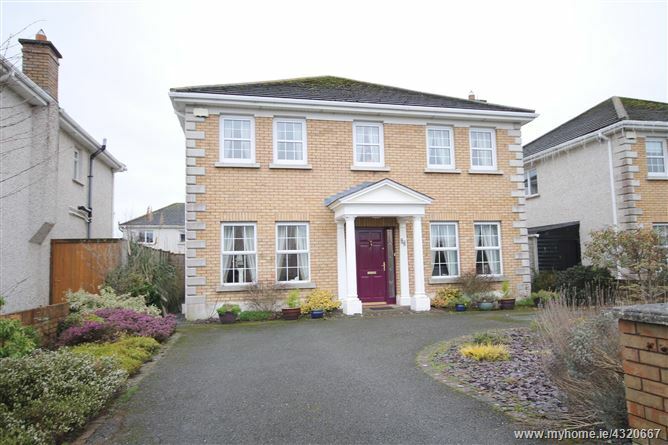 This is an imposing two storey residence approached by a tarmacadam drive to front, gardens to rear with wooden deck, paved patio area, shrubs, flowers etc. Built in 2001 with brick and dashed exterior, PVC double glazed windows, PVC fascias and soffits, gas fired central heating, sunroom extension, cream fitted kitchen with polished granite worktops and feature bespoke shelving and display unit in the sittingroom. 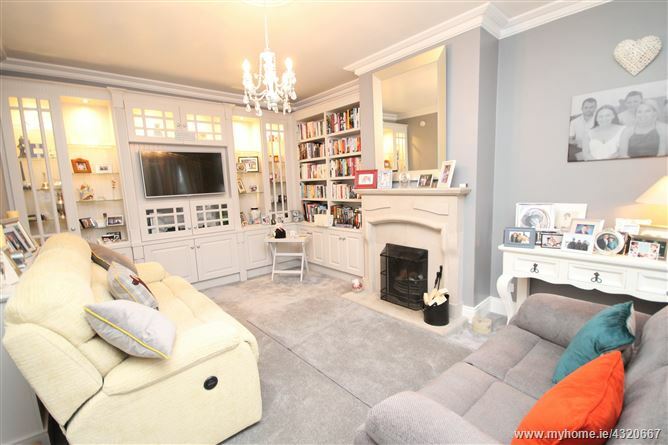 The house is presented in excellent condition throughout containing c.175.5 sq. m. (c.1,890 sq. 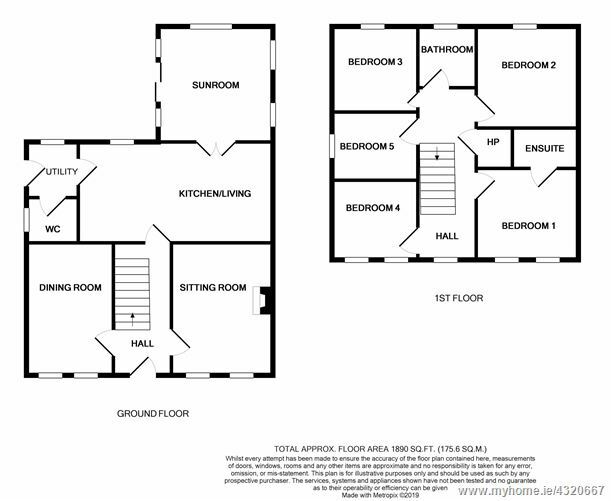 ft.) of spacious light filled accommodation and an ideal family home which must be viewed to be appreciated. The development is only a short walk from the town centre which offers an excellent array of restaurants, pubs, schools, churches, banks, post office all on your doorstep. Superb shopping is at hand with Penneys, T.K. Maxx, Tescos, Dunnes Stores, Lidl, Supervalu, Woodies, D.I.D. Electrical, Newbridge Silverware, and Whitewater shopping centre with 75 retail outlets, foodcourt and cinema. Commuters have the benefit of an excellent road and rail infrastructure with the bus route available from the Naas Road, train service from the town direct to the City centre and M7 Motorway access at Junction 10. 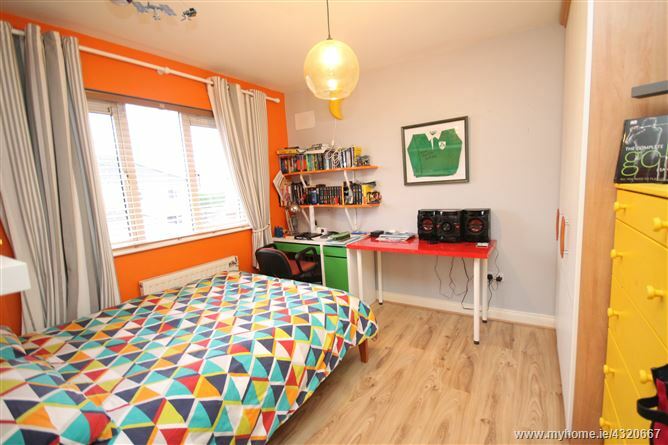 Local amenities include GAA, rugby, soccer, fishing, horse riding, canoeing, golf, leisure centres, hockey and horse racing in the Curragh, Naas and Punchestown. The town has the benefit of an excellent road and rail infrastructure closeby with the M7 Motorway access at Junction 10 or 12, bus route from the town centre and commuter rail service direct to the City Centre. Approached by a tarmacadam drive to front with shrubs and flower beds to front, side access on both sides of house with gates, rear garden with paved patio area, wooden deck, outside tap and metal garden shed. Mains water, mains drainage, refuse collection, gas fired central heating and alarm. Fridge/freezer, dishwasher, oven, hob, extractor, microwave, carpets, curtains, blinds, light fittings and metal shed. 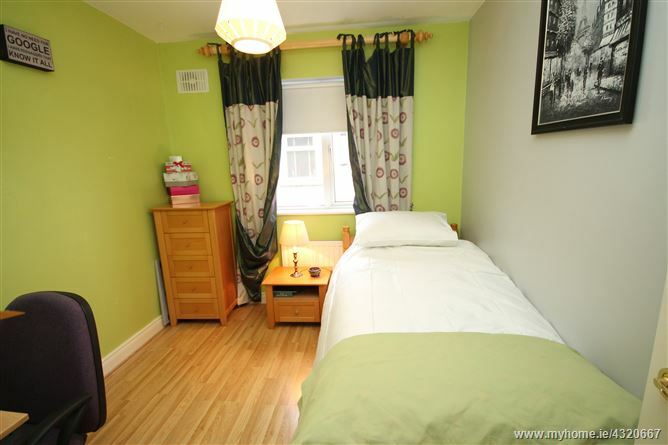 SOLICITOR: Ryan & Ryan, 5 St. Brigid’s Road, Clondalkin, Dublin 22. •	Maintenance free brick and dashed exterior. •	Sunroom extension to rear. •	Superb 5 bedroom residence. •	C.175.5 sq. m. (c.1,890 sq. ft.). •	PVC fascias and soffits. 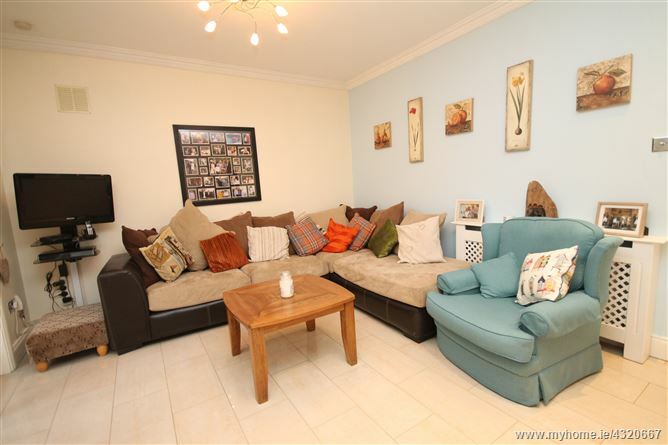 •	Excellent sought after location. •	Train, bus and Motorway closeby. •	Excellent educational, recreational and shopping facilities closeby. 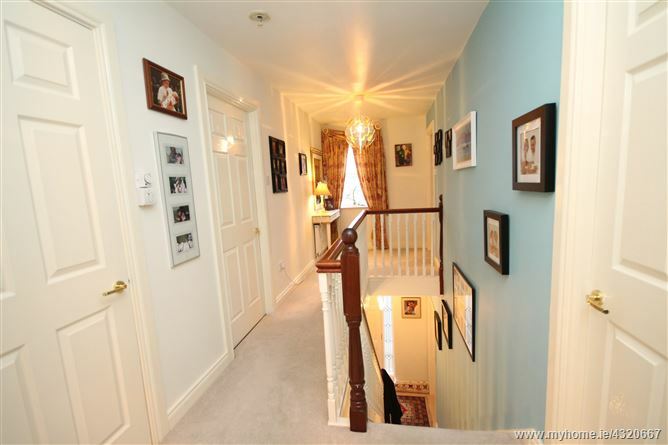 Entrance Hall: 4.85m x 2m. Laminate floor, polished porcelain tiled floor, coving and understairs storage. Sittingroom: 5.3m x 3.6m. Coving, feature bespoke fitted corner shelving and display cabinet. Sandstone fireplace. 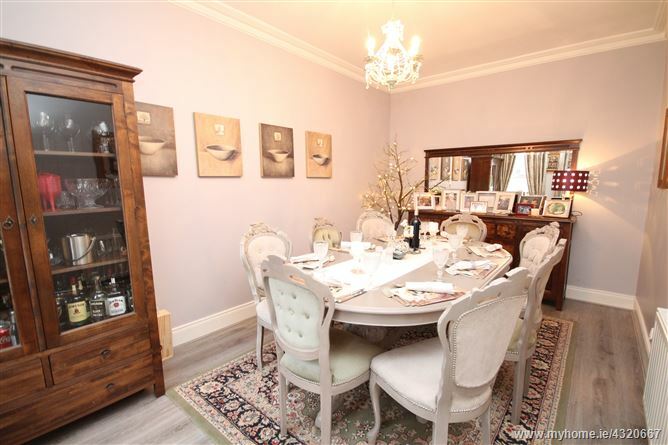 Diningroom: 4.85m x 2.92m. With laminate floor and coving. 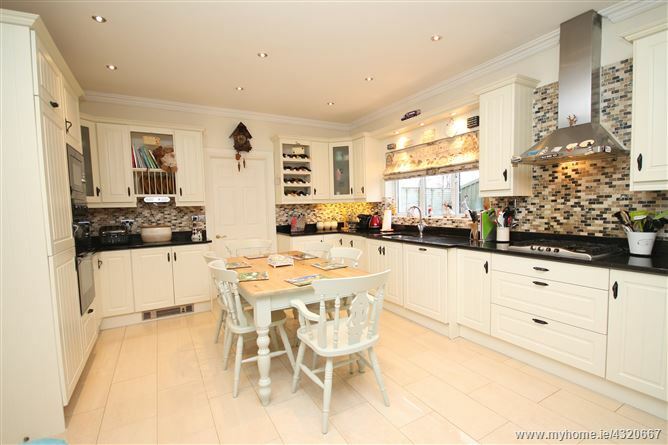 Kitchen/Diningroom: 7.18m x 4.4m. With polished porcelain tiled floor, cream built-in ground and eye level presses with polished granite worktops, integrated Zanussi fridge/freezer, Hotpoint electric double oven, Belling microwave oven, tiled surround, integrated Whirlpool dishwasher, coving, recessed lights, 4 ring gas hob, extractor unit and double doors to sunroom. 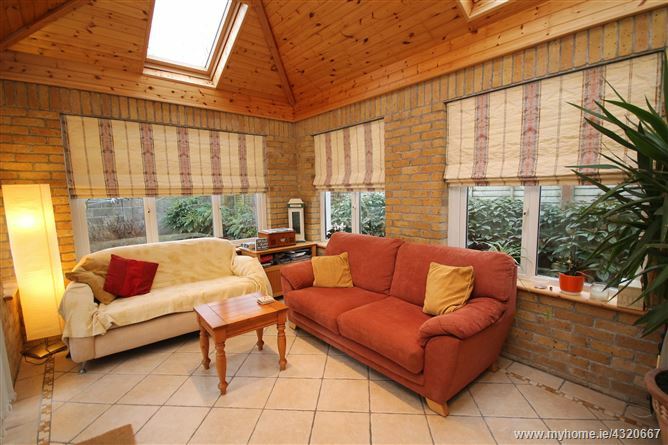 Sunroom: 4.34m x 3m. 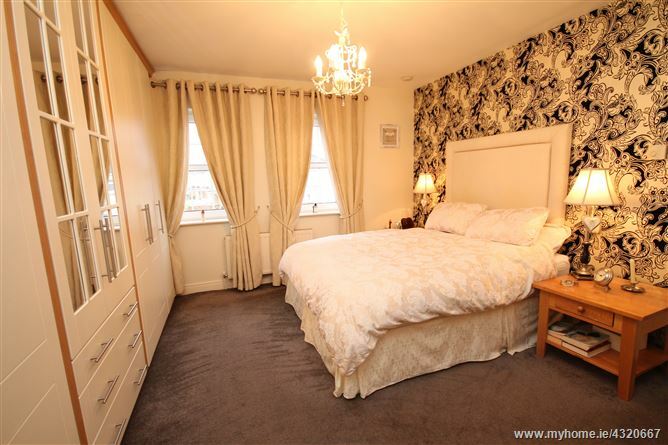 With tiled floor, patio doors to rear, wood panelled ceiling, recessed lights and brick walls. Utility: Plumbed, s.s. sink unit, built-in presses, gas burner and polished porcelain tiled floor. 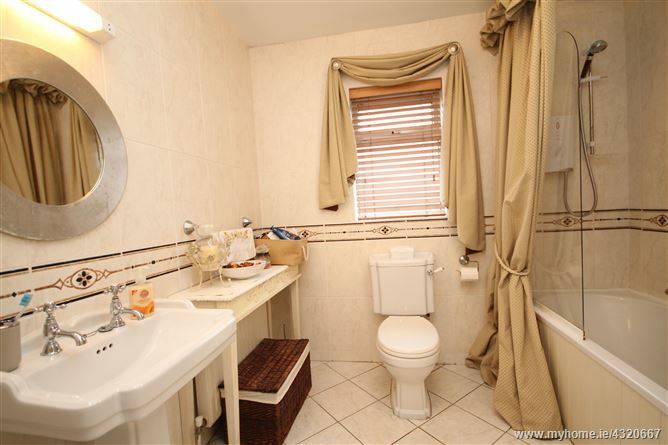 Toilet: w.c., w.h.b., wood panelled surround and polished porcelain tiled floor. Bedroom 1: 4.07m x 3.18m. With range of built-in cream wardrobes. Ensuite. W.c., w.h.b., bath, pumped shower, tiled floor and surround. Bedroom 2: 3.73m x 3.33m. Built-in wardrobes, laminate floor and shelving. Bathroom. W.c., w.h.b., bath, electric shower, fully tiled floor and walls. Bedroom 3: 3.27m x 2.95m. With built-in wardrobes and shelving. Bedroom 4: 3m x 3m. 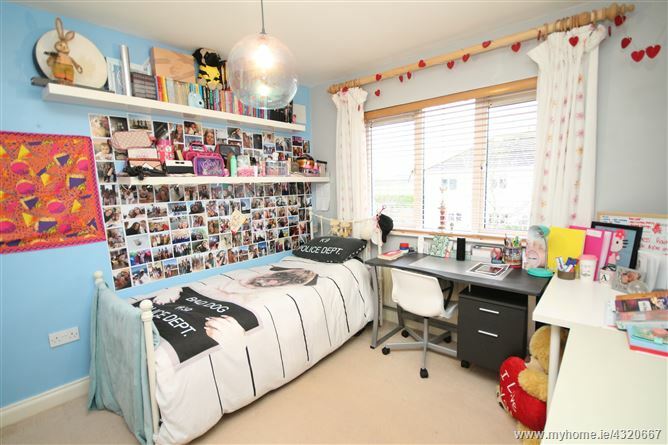 Built-in wardrobes and laminate floor. Bedroom 5: 3m x 2.62m. With laminate floor and shelving. Hotpress: Shelved with timed immersion. Folding attic stairs to attic area.